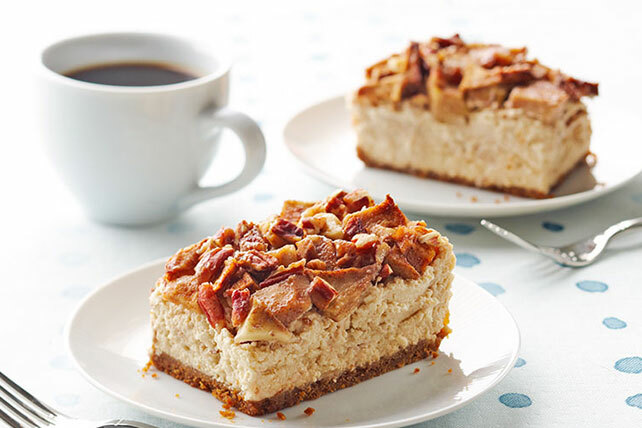 Combine the classic flavors of apple and pecan pies with a luscious cheese cake to make our scrumptious Apple-Pecan Cheesecake. Complete with notes of sweetness from brown sugar and the pleasing scent of cinnamon, you'll be hard-pressed to not fall for our Apple-Pecan Cheesecake. Line 13x9-inch pan with foil, with ends of foil extending over sides. Mix graham crumbs, butter and 2 Tbsp. sugar; press onto bottom of prepared pan. Beat cream cheese, 1 cup brown sugar and vanilla in large bowl with mixer until blended. Add sour cream; mix well. Add eggs, 1 at a time, mixing on low speed after each just until blended. Pour over crust. Combine apples, nuts, cinnamon and remaining sugar; spoon over cream cheese batter. Save 50 calories and 7g of fat, including 4 g sat fat by preparing with PHILADELPHIA Neufchatel Cheese, and BREAKSTONE'S Reduced Fat or KNUDSEN Light Sour Cream. For an extra-special touch, drizzle caramel ice cream topping over each piece of cheesecake just before serving. Prepare the apple topping using any of the many varieties of cooking apples that are available, such as Jonathan, Granny Smith, Rome, Empire or Cortland.